This is a sweet house, but it made me a little sad that the occupants were inside watching TV isntead of out on their lovely porch, on a beautiful late-summer evening. I hardly ever see people sitting out on their front porches anymore (I don't mean these folks specifically - but generally speaking.) Of course I'm presently working on my computer, not out in my community either! But my excuse is that it's nearly 11pm and it's raining! Post script: I will add that on closer examination I noticed that they are watching local news - the picture on the screen is of our Senator, Joe Lieberman, shaking hands with a potential voter. (You can tell if you click on the photo to go to Flickr, then view it in "original size.") He is quite an interesting story these days: a democrat, he ran for Vice President in 2004, with John Kerry. He's been in office for 18 years, and very much a leader among democrats. But he supported the war in Iraq, and an anti-war candidate beat him in the primary in August. So he's running as an independent, and now is making strong anti-war and anti-Bush statements to try to regain some of the votes he lost. the porch didnt seem abandoned. am sure the family still uses it. 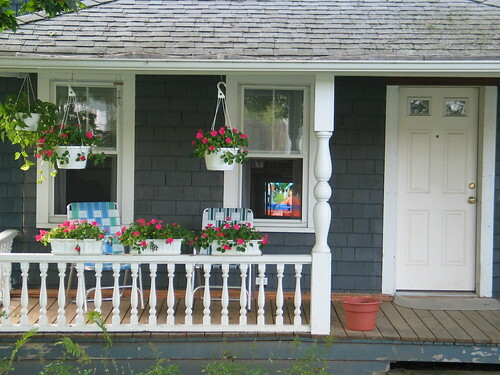 Its a pity if they dont ..
Lovely flowers on porch. Lieberman would get my vote! Many people who initially supported the war, based on info from DC have since changed their minds. What's wrong with that--the process of re-evaluating any decision and then modifying is supposed to be an acceptable process. Kate, I think it's great when people change their minds, if it's due to new information, thoughtful reconsideration, or a genuine change of heart. In this case, the sense is that Lieberman changed for purely political reasons - he didn't think he'd lose to an anti-war candidate, and only when he was in real danger of losing his seat did he suddenly change his stance. As a fellow Nutmegger, I LOVE all of your photos. It's amazing what humans can do with two hands and a camera. Your photographs allow us to share in your most delectable corner of the world where one is forced to stop and smell the roses, so to speak. Also, your comment regarding the human political arena is thought-provoking indeed. As a dog, I can only say that humans are a curious breed. I believe Mr. Maslow says it all too well in his hierarchy of motivational needs. Therein the question arises: who can you trust?